Welcome to the Marlow Canoe Club, United Kingdom. 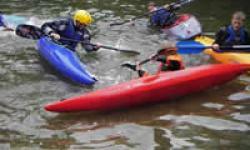 Marlow Canoe Club is a medium sized (around 150 members) club which caters for followers of just about every branch of recreational Canoeing, including white water, sea touring, inland touring, surfing, canoe polo and coaching. There are also a few members who take competitive Canoeing (in various disciplines) seriously. Marlow Canoe Club runs a range of courses throughout the year, with an accent on training novices up to be safe and competent. The courses are run to the relevant syllabus of the BCU star award tests, by Marlow Bridge experienced instructors who aim to give you more than just getting you through the test. Many course attendees carry on to become regular members of the club, allowing them to progress their skills further. 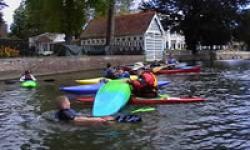 Marlow Canoe Club own a good selection of boats, including white-water craft, flat-water tourers, open canoes, sea kayaks and swimming pool kayaks. 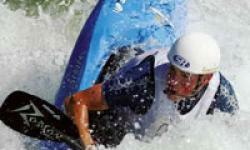 We also have paddles, buoyancy aids, spray decks and helmets. The only things that you will need to provide for yourself will be clothing appropriate to the season and weather. 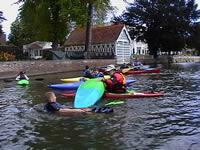 Marlow Canoe Club is an open club. It will accept membership regardless of age, gender, ethnic origin and has and adheres to a published Equal Opportunities Policy. 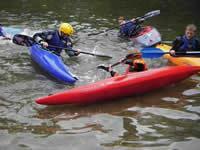 Canoeing is a suitable activity for those with disabilities too. We've had paraplegic members and have run courses for epileptic people. Some disabilities, unfortunately, cannot easily be catered for but we are happy to advise on what we can and cannot do.